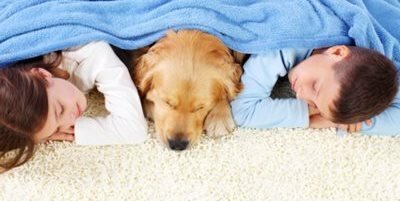 CRI > Benefits of Carpet and Rugs > Paws on Carpet: What is the Best Carpet for Pets? Many pet owners who are in the market for flooring might think that carpet is not an option for their homes and four-legged friends, but nothing could be further from the truth. We found the “Carpet Shopping for Pets” Checklist to make carpet work for your home. Advancements in manufacturing technology have made carpets better than ever. New product features allow carpet to hold up to the toughest wear from pets and humans. Stain resistance and durability are the most important features when shopping around for carpet for your pets. There are a number of different fibers to choose from in today’s flooring marketplace, many of which are designed to perform well with a pet in the house. The experts at your local flooring specialty store have the knowledge and experience to help you decide on what’s right for you. Colors and patterns might seem like a strange consideration to make in this situation, but the right color and pattern can help hide soil and pet hair. Try to match the color of carpet with the hair color of your pet(s). Pet-friendly carpet is here to stay, we love our pets and we love lying on the floor with them. With your gorgeous carpet installed, vacuum regularly with a Carpet and Rug Institute-approved model to keep carpet looking newer, longer. These tips make a great home with carpet for you and your pets.